Colonists introduced rainbow trout and brown trout to South African waters towards the end of the nineteenth century, in keeping with the Victorian custom of transferring British species to the far-flung corners of the Empire. Both species are cold-water salmonids and, as a result of the higher ambient temperatures in South Africa, they can only survive in montane regions. As the water warms on its journey downstream it reaches a temperature above which the fish can no longer survive. In a general sense, this thermal barrier is altitude dependent and so it may be visualised as coinciding roughly with a specific contour above sea level. The position of this contour in various regions in high summer more or less defines the lower limit of the zone in which trout can survive in streams or dams. Inasmuch as trout are alien species, conservation authorities, at the time of writing, are delineating the stream catchments within these zones which will be set aside for trout. The understanding is that trout will not be permitted in waters outside the demarcated areas. Rainbow trout are native to rivers in the Pacific Ocean drainage of North America. They prefer cool to cold oxygenated water, optimally between 13° C and 16° C. The critical thermal maximum (CTM) temperature they can tolerate is between 24° C and 26° C but scientists have found that this depends on the strain of the fish, its temperature history and its life stage - they have found rainbow trout that survived temperatures of almost 30° C.
Rainbows in South Africa feed on essentially the same types of prey as elsewhere in the world: aquatic insects include mayflies, caddisflies, midges, dragonflies and damselflies, and terrestrial insects are represented largely by ants, beetles and grasshoppers. Snails and crustaceans such as daphnia also feature prominently on the menu. Minnows are taken mostly in autumn and crabs and frogs add a significant touch of local flavour. In contrast to brown trout which are considered to be pool dwellers, rainbows favour faster water for feeding as well as holding. They can hold in flows ranging from 20 to as high as 80 centimetres per second and can feed in water flowing twice as fast. However, in small mountain streams where there is a scarcity of sizeable runs and riffles, they may only find suitable sanctuary in the slower and deeper water of pools or pockets. The spawning season commences in mid-winter. Stream fish and fish in dams with a suitable feeder stream will run upstream until they find appropriate spawning sites. In other dams the ripe adults will mill around inlets and gravel patches but, in the absence of flowing water, they cannot spawn successfully and will have to re-absorb the eggs or milt subsequently. This invariably causes fish to lose condition. Very few dams in South Africa have feeder streams that allow for natural reproduction and so stocking is the norm. By using triploid fish, spawning is precluded and adults are not subjected to the trauma following a failed spawning. Brown trout are much loved by fly anglers because of their selective feeding habits and wary nature. They occur naturally throughout Europe and western Asia, but they have been translocated to all the continents except Antarctica. In South Africa, self-sustaining populations are confined largely to a few rivers in KwaZulu-Natal and Western Cape. Their habitat preferences are much like those of rainbow trout with an optimal water temperature range between 8° C and 18° C, but they are reported to have slightly lower maximum CTMs - from 23.5° C to 26.7° C. Adult brown trout prefer to rest and feed in water with a velocity of about 15 to 70 centimetres per second but they can tolerate velocities up to 90 centimetres per second. They feed on essentially the same food items as Rainbow trout but, while the younger fish concentrate on insects and other invertebrates, the larger browns are active predators of fish, frogs and other larger prey. Like rainbows, they may target all available stages of insects during a hatch or concentrate on one stage only - some fish may be taking rising nymphs, emergers, duns and spinners whereas others may focus on a specific stage. They generally feed more actively in late afternoon or early evening but when the weather is cool and overcast, they will also feed during the day. The largest browns are predominantly nocturnal. Adults are more solitary and territorial than rainbows and apart from moving upstream to spawn, tend to frequent the same place in a river. Brown trout commence spawning in autumn and their requirements and spawning behaviour are similar to those of rainbows. If necessary, they are able to travel considerable distances to spawning areas or to winter refuges. All living organisms, including the fish we seek, are distributed according to their environmental requirements. For that reason, trout are not randomly dispersed in the waters they inhabit, but seek out specific sites that satisfy their needs and avoid those that don't. Inasmuch as the favoured sites represent only a small proportion of the available water, being able to recognise such productive locations from the fish's point of view is a basic angling skill. In certain respects, each body of water is unique and having local knowledge of it is a valuable asset. By the same token, all trout waters have many characteristics in common and it is the ability to recognise and correctly interpret these features that allows the angler to approach a new body of water with confidence. In essence, being able to 'read' a stream or dam may spell the difference between failure and success. In his A View of the River, Luna Leopold (2003) shows a cross-section of a typical Rocky Mountain stream, about 5 metres wide and 1 metre deep and with a fairly uniform streambed. The measured flow velocity ranges from 10 centimetres per second along the bottom and sides of the channel to more than 200 centimetres per second at the top. This variation is caused by friction between the flowing water and the channel boundary. Most anglers are aware of the fact that water flows at different speeds in different parts of a stream, but the very low velocity along the bed and the magnitude of the difference between slowest and fastest flow comes as a considerable surprise. It should be clear now why trout are able to hold tight against the bottom or sides of a stream channel, even in fast-flowing streams. Leopold's data are for a stream with a fairly uniform bed. By contrast, try to picture the considerable amount of turbulence, vertically and laterally, that a highly irregular streambed can generate. This must break the main flow into myriads of smaller current tongues, eddies, reverse currents and vertical flows in which there are countless pockets of quiet-water lies and holding areas for trout. It offers concealment from predators. It provides a cushion of quiet water that permits the fish to maintain station with a minimum of effort. The water temperature is appropriate and it is sufficiently oxygenated. A place where trout are screened from predators by overhead cover, a turbulent surface, bubble curtains or water depth, meets the first of these requirements - it is known as a sheltering lie, escape lie or sanctuary. The second, or feeding lie, is often of a temporary nature, depending on the timing and availability of food - studies in the USA have found that larger trout may move as far as 30 metres to a feeding lie. The third and fourth are called holding lies or, as I prefer to call them, 'comfort stations'; some of them also allow the trout to monitor an important food-carrying current. A lie that combines all these positive elements is commonly termed a prime lie. All these requirements can be met in an endless number of ways and it is up to you to recognise them wherever they occur, singly or in combination. What you see in a stream reflects its bed form and the pattern of its morphological features such as pools, riffles and runs and the materials forming the streambed. The development and specific sequences of these features, although a fundamental stream process, is still unique to each and every stream. For hydrologists and geomorphologists the pool-riffle sequence, a succession of one or more combinations of pools and riffles along the channel, is the primary element in alluvial stream channels. This classification describes the channel shape and its scour pattern. In most upland streams the pool-to-riffle ratio is fixed. Ecologists have expanded this classification by also incorporating habitat data in their measurements, and by subdividing the basic stream components - from an ecological perspective, these are known as geomorphic channel units or GCUs in scientific parlance. To the fly angler the alternative names, habitat type or mesohabitat, may be more familiar and comfortable. The habitat and hydraulic data that are physically measured on streams can be modelled in a computer and this enables fisheries biologists to identify and quantify the type of habitat required for a stream to produce and sustain trout. Understanding how and why trout utilise such areas can significantly enhance the angler's chances of locating fish and then catching them. The most widely used classification system at present divides streams into riffles, pools, and runs. Each of these units can be further subdivided. Riffles are bars in a stream where coarse sediment has been deposited so, in effect, they are 'bumps' on the streambed. They occur at more or less fixed intervals along the stream and generally migrate very little, if at all. Low-gradient riffles are portions of the stream channel where water velocities are moderate but more or less uniform, water depths are relatively shallow (from say 10 centimetres to a metre or more) and the substrates are typically gravel and/or cobble. Riffles occur in straight reaches of a stream where the gradient is less than 4 percent (4 cm/m) and the streambed material is fairly well sorted and more or less of a consistent size. This gives rise to the characteristic 'bouncy' surface or 'corrugated water' as Tom Sutcliffe calls it. During flooding, a riffle can look like a run. Rapids are shallow stretches with a gradient of more than 4 percent, high current velocity, considerable turbulence and typically, a substrate of boulders. The flow is diversified and characterised by the presence of white water. Cascades have very steep gradients and are distinguished from rapids by having alternating small waterfalls and shallow plunge pools, usually with bedrock or boulder substrates. This type of habitat occurs in rapids where the current velocity is too high for trout to hold for any length of time. However, there are invariably numerous obstructions, usually boulders and blocks (in some southern Drakensberg streams there are sandstone blocks almost the size of a small house) that break or deflect the current flow and create quiet pockets of slack water. Runs typically are found in the transition zone between riffles and pools and also in low-gradient reaches with no flow obstructions. They are intermediate in many characteristics between riffles and pools in that they are moderately deep, from 40 centimetres or so to a metre or two, depending on the size of the stream. Runs are more or less of a uniform depth and have little or no surface turbulence. Whatever its size, in any stretch a run is always deeper than a riffle but shallower than a pool - if you cannot classify a channel type as either a riffle or a pool, it is almost invariably a run. Water velocities range from moderately fast to slow but the smooth water surface is the deciding characteristic. The prevailing water velocity controls the size of the streambed sediment which may range from cobbles to coarse sand. Larger rocks and rock piles cover the substrate in many runs. During periods of low water flow or droughts, runs may become riffles. Some ecologists use the term glide as synonymous with run but, for anglers, a glide is unequivocally a smooth, glassy, slow-water run. The stream channel in a pool is generally wider and the water slower and deeper than a riffle or run. Typically, a pool consists of a head (some call it the throat) where the water enters, the belly or main body of the pool where the water gradually deepens, slows and levels off, and finally, the tail where it shallows and gathers velocity before entering the next habitat type. The shallowing at the tail end distinguishes a pool from a run. The surface is smooth with little or no turbulence but eddies may be present. Pools can form downstream from depositional bars, in backwater areas, around boulders or woody debris, above impoundments or even in cascades. This variety of hydraulic processes gives rise to many different types of pool - these need not be mentioned here except perhaps for the bend pool, the well-known depression scoured on the outside curve of a meander, and the plunge pool, a basin scoured by water dropping vertically over a channel obstruction or nick point, typically in a stretch of fast water. All South African trout streams are in mountainous country. The three major trout regions are the Mpumalanga Highlands, the Drakensberg (including the Maloti Mountains) with Lesotho at its core and the Western Cape Fold Belt. Geologically, topographically and climatically these regions are dissimilar and the streams draining them also differ accordingly. However, for angling purposes, there is sufficient uniformity to allow them to be treated as a whole. 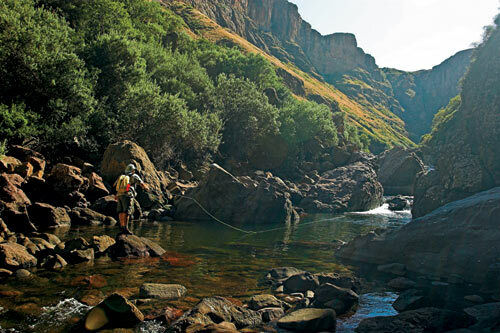 Drakensberg streams make up at least 90 percent of South African trout waters, span the greatest range of habitat types, and naturally reproducing trout populations form the backbone of the fishery. Accordingly, I will consider a hypothetical river in KwaZulu-Natal, springing in the high Drakensberg, as being the norm and, where necessary, modify my comments to apply to streams in other regions. High-gradient stream: slope more than 2.0 percent (20 cm/m). Medium-gradient stream: slope between 0.5 percent (5 cm/m) and 2.0 percent. Low-gradient stream: slope less than 0.5 percent. With the exception of the Wildebees, Mooi and Little Mooi (Eastern Cape) all streams coming off the main escarpment of the Drakensberg originate in the thick cap of hard, dark Drakensberg lava with its characteristic organ-pipe structure. Initially, these small streams and waterfalls tumble precipitously down the steep face; lower down, where they encounter the softer cream-coloured sandstones of the Clarens Formation, the gradient lessens dramatically. There is no specific altitude or gradient that determines where trout are first able to find conditions suitable for survival - that depends entirely on the local topography of each stream. In several rivers on the KwaZulu-Natal side, trout appear at around 1600 metres where the gradient may be less than 2 percent on some or more than 3 percent on others. On the Mooi, they occur above 1800 metres and, in the Boesmans above its confluence with the Ngwangwane, Bob Crass mentions catching trout in this stream at an altitude of more than 1900 metres. In the Eastern Cape Drakensberg, the streams generally originate at altitudes of less than 2600 metres, their gradients are less severe and so they can support trout at much higher elevations. The Kloppershoek tributary of the Bell River near Rhodes is said to carry trout as far as the Tiffindell Ski Lodge which, at almost 2600 metres, would make it the highest trout water in the RSA. Above Rhodes, the Bell already has substantial pools at around 1900 metres elevation. With the exception of the Holsloot stream near Worcester, Western Cape trout streams spring at altitudes of 1500 metres or less and they become fishable closer to their sources than the other trout waters. They all originate in quartzitic sandstones of the Peninsula Formation and consequently are low in nutrients. Mpumalanga trout streams have their source in a variety of geological formations. Most originate at around 2100 to 2200 metres, descend a couple of hundred metres or more to reach fishable size and then, when they get down to about 1400 metres, they become marginal trout habitat. Headwaters are usually the domain of small trout, except when spawning adults may be present during winter. Typically, in these small streams, the habitat types are compressed into a mix of rock gardens, short stony runs, pocket-water rapids, plunge pools and perhaps a few small pools, mostly with bedrock bottoms. Because of the size of the water, cover is imperative for the survival of small-stream trout. Very shallow pools with little or no cover are unproductive. Look for a pool that is deeper and wider than the average width of the stream with sheltering holds for trout. The best lies are usually at the heads and tails of larger pools and plunge pools, in pockets in fast water and against larger boulders in runs or pools. In this environment, the swift-flowing streams typically hold headwater macro-invertebrate communities so expect to find flattened mayfly nymph types, caddis that can attach themselves to rocks, black fly and net-winged midges. Terrestrials will make up an important component of trout diet. It is almost axiomatic that fishing small headwater streams boils down to presentation - whereas a well-presented fly may interest a fish, a poorly presented one will almost certainly send it skittering for cover. Mostly, that means your first cast has to be on the button and for that you have to be in close. You can only get close if your approach is cautious, patient and stealthy or, as H C Cutcliffe (1863) described it some 150 years ago "Keep down close to the mother earth; go on your knees or crawl on your stomach." If possible, stay out of the water but if you have to wade, do so slowly and cautiously. Approach each potential lie with the intention of casting to that spot without revealing your presence - make use of any available cover that offers concealment or breaks up your silhouette. Casting sidearm with the rod parallel to the water rather than held vertically and from a kneeling position substantially reduces your profile and, in this regard, the lightweight neoprene kneepads used by Ed Herbst can pay significant dividends. In exposed places, stand well back and cast onto the bank, letting only the leader and flies fall on the surface or, alternatively, cast across boulders to reach a sweet spot. In some situations you may have to rely extensively on the side-arm cast but, whichever method you use, keep your fly and leader in the same current lane and the line off the water if possible. It is preferable to have the sun behind you but not if it is low in the rear and throws a long leader-and-line shadow towards the fish. Because of the sparse insect populations in headwater streams, trout are not fussy about fly pattern. Having said this, most expert anglers have very definite preferences. The following list of favoured flies includes original patterns as well as their variants. Among dry flies, the Elk-hair Caddis and Kaufmann Stimulator are universal favourites although they are increasingly being superseded by Hans Weilenmann's CDC and Elk. In KwaZulu-Natal, small stream specialist Peter Brigg has never wavered in his choice of a Mayfly Spinner as the most productive pattern. Next in line are grasshopper, beetle, and ant patterns as well as the RAB, Humpy and Klinkh�mer Special in #12 to 20. Among artificial nymphs, the Gold-ribbed Hare's Ear and Pheasant-tail Nymph head the list and Tom Sutcliffe's Zak Nymph has also become a firm favourite. Wet flies include sinking versions of beetles and ants and many anglers are particularly partial to various partridge-hackled spiders (soft-hackle flies). Sizes 12 to18 should cover the range of subsurface patterns and you may fish them in tandem with other patterns on a two fly rig and with or without bead heads. Traditionally, spiders are fished unweighted, singly or as a team. Shallow water is the norm in the headwater regions and so most anglers find a dry fly fished upstream suffices. Start casting to the tail and work your way upstream. When trout do not respond to surface offerings, a wet fly or spider pattern fished upstream often produces. Where you do come across the occasional deeper hole, probe it with one of the recommended nymph patterns. Fishing headwaters will undoubtedly provide you with some of the most pristine, uncluttered small-stream trouting you will ever experience. For fishing headwaters in South Africa, a modern 3-weight outfit is probably the heaviest you'll ever need. Western Cape anglers are partial to flea-weight outfits (from 2-weight down) and because you are fishing very close in, Ed Herbst recommends that you overline your rod by one line weight to compensate for the shorter casts. This slows the casting cycle and enables you to cast 2 to 3 metres of leader and 2 metres of line with ease. Rod length is a matter of personal preference and a floating double-taper line is the only one you'll need. As the gradient decreases to less than 2 percent or so, the channel units become progressively larger and more differentiated and the riffle-run-pool sequence now becomes a recurring feature. The streambed is largely composed of coarse gravel, rubble, rocks, boulders and even silt and detritus. The living community also expands and trout foods become more diverse: mayflies, caddisflies, dragonflies, midges, minnows, crabs and frogs. Not surprisingly, this is usually the most productive stretch of a trout stream because of the abundance and variety of habitat types and food items. As each riffle, run or pool is unique, you will need to examine it meticulously and thoughtfully to unlock the complexities of its habitat types and currents. Only then should you consider where to place your fly so that it rides the currents naturally and in accordance with what the fish in that particular locale have come to expect. Riffles are a common feature of the middle reaches of our trout streams. They have been aptly described as the larders of a stream but, despite their productivity, not all are home to trout for any length of time. They may be too shallow or devoid of cover, in which case trout will only move into them for a brief feeding spell when the occasion warrants, such as during a hatch. Even then, the choppy surface may make it difficult to see trout unless they are feeding off the surface. In deeper riffles, look for places that provide protection from the current as well as from predators. Most often this will be where the water flows over completely submerged obstructions or around partially submerged ones. Over subsurface obstructions, this generates moderate surface turbulence that manifests itself at the surface in the form of 'boils' or standing waves. Both types of obstruction deflect the currents and create eddies on the lee side. Conventional wisdom has it that the eddy below the rock is the prime spot, but many trout prefer to hold in the cushion of water on the upstream side from where they can observe their territory more readily and intercept food that comes drifting by. So, search the upstream cushion first, then the sides of the obstruction and finally the eddy on the downstream side. Other places likely to harbour trout are overhanging bankside vegetation and any deeper water such as holes or the small scour channels or drop-offs alongside gravel bars left by the previous flood. The smoother surface of a run makes it easier to see the bottom provided the water is clear enough and not too deep. If you can see feeding or holding trout, then sight fishing is decidedly your best bet. If you cannot spot any fish, it does not mean there aren't any; after a few years of eluding predators, trout learn to evaporate in ankle-deep water. In a run, they will seek out any obstruction, usually bedrock slabs, larger rocks or rock piles that can provide a comfortable holding area. To locate those that lie below the surface, look for the same 'boils' or standing waves as in riffles and fish them in the same way - a choice spot is where two currents that have diverged around a rock converge downstream. Undercut banks, fallen trees and overhanging riparian vegetation also provide first-rate lies for trout, particularly if there is a current trundling by alongside the lie. All the imitations that are favoured for fishing the headwaters will also score in the riffles and runs of the middle reaches but with a bias towards larger sizes. In addition to the Pheasant-tail Nymph, many small, dark nymph patterns, with or without beads, mimic the omnipresent Baetid nymphs. Flashback nymphs perform well in all regions and, for caddis, try one of the many Green Rockworm imitations of the ubiquitous Rhyacophila larva and a Sparkle Pupa. Among floating flies, that worldwide favourite, the Parachute Adams, is a top choice. For emerging and adult Baetids there is a host of effective generic blue-winged olive patterns and as many or more imitations of caddisflies. Type the name of the fly and Google images into your computer search engine and you will find all the information you need as well as YouTube videos showing how to tie them. Small-stream experts such as Peter Brigg, Tom Sutcliffe and Ed Herbst are exponents of fishing close in with short, repeated, drag-free drifts - Ed says that in Cape streams they often make as many as two casts per minute. If you don't get any response after a few drifts, move on. The fastest water in a pool is where it rushes in at the head but, provided the force of the water is broken by ledges, boulders or other irregularities, fish can find a comfortable lie here. The best lie in a pool is considered to be what Ed Herbst calls the 'eye' (a New Zealand term) - the small triangular eddies of quiet water that form at the head of a pool between the main current and the bank. The combination of depth and velocity in this part of the pool usually means it has to be fished with a weighted nymph pattern, a wet fly or streamer. Current seams, as elsewhere, are high-priority targets because of their ability to concentrate food items along the seam. As the water enters the midsection of the pool it becomes deeper, slower and wider and may be split into additional currents by obstructions. This is traditionally the domain of the biggest fish. Researchers in the USA have found that your chances of locating a large brown trout in a pool increase enormously if that pool is at least 90 centimetres deep, contains woody debris (fallen trees, log jams), in-stream rocks or rock piles, and overhead bank cover (overhanging banks and/or overhanging vegetation). As the cover types and depth in a pool increase, so does the probability that large trout will be present. Now, for experienced anglers all of this is old hat, but the novice can take comfort from the fact that this traditional wisdom is scientifically correct. Incidentally, this same study also showed that, all things being equal, a big brown would choose the widest pool available. Big trout in pools are inclined to feed less often but to concentrate on larger prey. This means that if you want to tempt a large fish you have to present it with a fly of the appropriate size and behaviour in the place where it normally encounters its prey, and that is almost invariably on the bottom. Large Woolly Buggers, Woolly Worms, Mrs Simpsons and minnow imitations in sizes 2 to 8 are firm favourites of anglers who seek trophy trout in deep water. At the tail-out, the water is funnelled into a much smaller cross-sectional area and any food drifting down the pool becomes concentrated here and more easily available to trout. On the other hand, this advantage is offset by the slick, thin water which leaves the trout seriously exposed and extremely skittish. In broad daylight it needs a compelling incentive, usually in the form of readily available food, to lure trout into this area. In low light, however, some of the largest fish in the pool often position themselves in the tail-out - an area that seemed fishless during the day, comes alive at dusk. This is not an easy place to fish though, and for this reason many fly fishers avoid it. Apart from jittery fish and a more-or-less exposed angler, the accelerating current can easily cause drag in a conventional upstream dry fly presentation. This needs to be countered with some rather fancy slack-line casts, whether you are fishing from upstream or downstream. Alternately, try drifting a small spider or nymph through the tail-out from an upstream position. Pocket water is not confined to headwaters. Wherever the gradient becomes steep enough, any stream will form rapids within which obstructions form pockets of quiet water that protect the trout but offer ready access to the food-carrying currents alongside. During periods of low water and high temperatures they also carry significantly more oxygen than slower stretches and provide relief for stressed trout. With few exceptions, South African trout streams are rather small and so are the rapids within them. The fast, turbulent water in a rapid enables the angler to get very close to the fish - often only a rod length away. This calls for short casts or even dapping with a bushy, high-floating, easily-visible dry fly. Failing this you may try dropping a very heavily weighted nymph or team of nymphs, Czech-style, into the pocket. A decade ago, a 5-weight outfit would have been considered the norm for fishing the middle reaches. Now, considering the average size of the trout taken, increasing numbers of anglers are finding that modern 3- or 4-weight tackle is perfectly adequate. However, for those seeking big trout in deep, turbid pools on rivers like the Langkloof in Barkly East, the traditional approach of a big Walker's Killer, Mrs Simpson or Woolly Bugger on a heavier rod, a sinking line and 2-metre level leader, seems appropriate for fish attuned to large food items. The references at the end of this chapter contain a wealth of information on rigging, fishing and specific fly choices in all regions. By the time South African streams reach the low-gradient stretches they may carry many riffles, runs and pools but, without exception, they are too warm in summer to sustain trout permanently. Moreover, they are now surrounded by agricultural land and, in the summer rainfall area, flooding is common and the streams are often heavily laden with silt. In winter, however, the lower reaches of certain streams such as the Bushmans, Mkhomazi and the Mkhomazana in KwaZulu- Natal provide ideal sanctuaries for big brown trout that tend to migrate downstream after the spawning season. During his KZN days, Tom Sutcliffe and the late Hugh Huntley were alert to this phenomenon and took many a trophy brown from these sections. Spring and autumn are unequivocally the best times to fish the streams and rivers in the traditional trout regions of South Africa because during these periods water temperatures are in the optimum range for trout. Given normal climatic conditions, a typical spring will see the rivers of Western Cape brim-full after winter rains, whereas elsewhere they will be low and stable with water levels likely to start rising with the first summer rains. In autumn, typically, these conditions will be reversed. In spring, increasing temperatures accelerate trout metabolism as well as that of the organisms upon which they prey. It is a time when the fish are constantly on the lookout for food and so a well presented artificial is likely to draw a response. The fish may take throughout the day but if there is a peak of insect activity, commonly in the late afternoon or towards dusk, that is the prime time to be on the water. In the summer rainfall area, dirty water can be a problem in the middle and lower reaches of a stream. If you can, try to fish the river when it is fining down after a rainstorm. During a dry, hot spell the best time to be on the water is at dawn when water temperature is at its lowest. In autumn, the tempo of aquatic life changes. Some of the late-season caddis and small Baetid mayflies are still active but essentially nature is preparing itself for winter and the surge in terrestrial insect activity is reaching its peak. These insects now become the dominant food items, particularly in the upper reaches of most streams. Most natural lakes have been in existence for a very considerable period of time, their age ranging from thousands to millions of years. During this period they have adjusted to the physiographic and ecological nuances of their surroundings, hence it is easier to recognise those areas within them that are favoured by trout. In South Africa, even the oldest trout dams only date from about the 1920s - the majority are 40 years or less and coincide with the boom in trout fishing during the latter part of the twentieth century. With notable exceptions, the larger the area of a man-made impoundment, the greater the probability of the flooded area being topographically more diverse and, therefore, more akin to a natural lake than a smaller body of water. In addition to the original stream channel, you may expect, among others, underwater gullies, rock piles, outcrops, cliffs and trees - all features that provide dam trout with essential habitat requirements. But, at least, they are recognisable and provide valuable clues in the tricky task of reading a dam. In contrast, many small dams that have been scooped out in a watercourse resemble a simple soup bowl in profile - they slope uniformly from the sides inward, have a more or less irregular triangle shape and are difficult to read because they are so featureless. How do the five primary requirements for trout to survive in streams manifest themselves in stillwaters? In a typical South African dam, the only predators likely to take large trout are fish eagles, otters and man. Fry and smaller fish, if present, have to seek concealment from a host of predators that include cormorants, kingfishers, frogs, toads and their cannibalistic elders. Deep water and aquatic vegetation provide obvious sanctuaries but trout can also hide against rock piles, outcrops and in the shade of bankside trees and cliffs. In eutrophic dams reduced water clarity can lessen fish visibility significantly and so can a rippled or choppy surface, rain or wind-induced muddy water, or low-light conditions. The fertility of a dam determines the amount of food available to fish but, as a rule, dams produce considerably more food than streams. The major difference is that whereas trout in streams utilise the currents to bring their food to them, their stillwater brethren have to sally forth and actively hunt for food whenever they want to eat. They grow bigger because there is more food available and they do not expend energy in holding station against the current as stream fish do. Dam trout have the advantage that when they come across prey, they usually do not have to make split-second decisions and can spend significantly more time in assessing it. In most dams the effect of the feeder stream is spatially restricted whereas the usual wind-induced currents, by their nature, allow trout to rest comfortably virtually anywhere. In a stream, gradient determines water velocity which, in turn, determines the degree of turbulence and hence the amount of oxygen that is dissolved in the water. Feeder streams may contribute some oxygen to dams but the primary source is wind which disturbs the surface and mixes oxygen into the water. Most South African trout dams are comparatively shallow and so oxygen is fairly evenly distributed through the water column, especially if the water is clear. When surface temperatures approach the critical thermal maximum, the only recourse that trout have is to seek the cooler depths, although they may also find relief at the inlet in those dams that have a cold feeder stream. Having ascertained the needs of trout in dams, how do you use this information to determine where trout position themselves? The toughest challenge if you're new to this fishing, is knowing where to start. If possible, try to get yourself to a vantage point from where you can look down on the water you intend fishing. On a calm, sunny day, and with the help of polarised glasses you may be able to learn a great deal more than from close up. Observe and note the overall structure, the presence of irregularities in the topography, rock outcrops, rock piles and small cliffs, points and promontories, the slope of the surrounding land, the extent of the shallows, the position of the old stream channel, the presence and extent of weed beds, drop-offs, wind direction and rippled water. If you see fish rising, try to ascertain whether the rises are random, whether they follow a pattern or whether they are confined to a particular area. If you do not see any rises, search the shoreline carefully, examining rocks and foraging among the vegetation to see if perhaps there is a migration of dragonflies, damselflies or other creatures into the shallows. In Mpumalanga dams, in the early morning in summer, you will often come across pupal shucks of chironomids that hatched during the previous night. If the dam you are fishing has a good feeder stream it will bring in food as well as cool oxygenated water - Nigel Dennis is adamant that it is the first place he heads for when fishing a new dam. The shallows are the most productive areas of dams and offer the best prospect of finding fish. Water that is less than 60 or 70 centimetres deep can sustain a prolific growth of aquatic vegetation that harbours a host of invertebrates and other trout foods. It is also good juvenile trout habitat but larger trout will only enter it under exceptional circumstances in bright light conditions, as they are very vulnerable to predators. Typically, the shallows are fringed by vegetation such as bulrushes, common reed and sedges followed away from shore by submerged weeds, some of which are well below surface whereas others reach the top. Although weed beds in dams fulfil the same function as riffles in a stream, trout generally do not seem to like rooting around inside them. Instead, they prefer to hang around the edges, in the gaps, or just above the top of deeper beds from where they can dart in and seize whatever prey makes its appearance. Trout are particularly partial to drop-offs, the most obvious of which will probably be along the old stream channel. They will wait or patrol within a metre or so from a drop-off until they spot a food item on the shallow side and then nip in to grab it. Wind can have a profound effect on your ability to take fish. During a strong wind it can be very uncomfortable and frustrating to fish. A gentle breeze, on the other hand, brings on a ripple which oxygenates the water, masks near-surface fish and concentrates food - the seam between rippled and smooth water, in particular, is a choice feeding place. Why? Because that's where the breeze first touches the water. Most dams in South Africa are in open grassland so when the wind starts blowing there is a strong chance that terrestrial insects will end up in the water. A good place to fish when the wind starts blowing is the leeward shore where the insects first contact the water. If the wind has been blowing for several hours, the drowned bugs will accumulate on the windward shore so head that way and start casting into the wind. The water close in to the bank will probably be churned up and muddy but, farther out, where clear and discoloured water meet, is where you should focus your efforts. Overhanging trees are not common along local dams but, if there are any, fish around them, as trout may utilise them for cover and shade. Presumably, your examination of the shoreline and shallows should have provided some clues as to which trout foods inhabit the dam. If there are several, you may have to figure out which one is the principal food item and select your fly accordingly. If this pattern fails to produce, try imitations of the other creatures in your sample. Bear in mind that changing to a different size of the same pattern may be as shrewd a move as switching to another pattern. There is a much greater probability that the fish are either feeding on the bottom or at or just below the surface than in between, but there are times when they will be combing the mid-depths. Their presence near the surface is usually revealed by displacement of the water and finding the bottom is fairly straightforward. But finding that elusive correct depth in between can only be done by trial and error and you will be obliged to resort to the rather tedious countdown method. Sometimes trout will take a fly that is barely moving but other times they will only respond to one that you strip-in at high speed or at any speed in between. You will not only have to vary the speed of your retrieve but also the way you manipulate the fly until you find the right combination. Keep in mind that you are trying to replicate the movements of a live organism and, as Nigel Dennis, author of the Getaway Guide to Fly-fishing in South Africa (2004) so aptly remarked when referring to the commonly used retrieve, "...there is no creature on the trout's menu that goes zip, stop, zip, stop, in 60-centimetre darts." Another point that is perhaps not adequately emphasised is the direction of the retrieve - during emergence, damselfly and dragonfly nymphs will be moving horizontally towards the shore, minnows may be fleeing away from it, water boatmen will dart up towards surface and back down again, pupae of caddisflies and midges will have a predominantly upward movement and so on. If you are fishing imitations of these insects, try to move your fly in the manner and direction which mimics the behaviour of the natural. If, during all this experimentation, you have not caught a fish, do not stay rooted in the same place - move on and try another spot. Fish will often be feeding close to the bank so, if you intend wading, first explore the shallows with a series of short casts before entering the water. After entering the water, make a short cast parallel to the bank, retrieve your fly and make successive casts in a fan-like pattern until you are parallel to the bank on your other side. Now extend line and repeat the process until you catch a fish or until you reach your casting limit and have to move on. If the trout are in the shallows and you are performing competently, then fishing from the bank or wading the shallows should get you into lots of fish. Nonetheless, you will still be under an enormous handicap compared to the angler who fishes from a flotation craft such as the float tube. They offer you so much more mobility and versatility they could be considered mandatory for the serious dam trout angler. Fishing a static line is particularly effective when you make use of a flotation craft. There are many ways to fish and manipulate a static line but it is extremely important that your line and leader lie out straight, as most takes come as the fly is sinking. The trout generally take the fly very gently so you have to watch the end of your fly line most intently and tighten immediately you see any movement. This is not possible if you have slack in your line, hence the necessity of casting a straight line and leader. A particularly effective way to fish a static line when the water is clear and the surface is wind-ruffled is with a dry fly. Locally, there is really only one contender - Tom Sutcliffe's DDD. This is, arguably, the greatest searching dry-fly pattern in South Africa and one that reportedly will draw fish to the surface from as deep as 4 metres. Tom thinks it is more effective with a bloodworm suspended below the DDD. Dam anglers usually settle for 4- to 5-weight outfits depending on the size of the fish being sought and the strength of the wind. Rods of 2.7 metres or longer are the preferred choice as they keep the line high, particularly when fishing from a flotation craft. Your workhorse line will be a standard, weight-forward floater but if you intend probing the depths when the fish are down, you will need a repertoire of sinking lines that start with an intermediate clear/camouflage line and may end with a type-five sinking-rate line. Some anglers favour sink-tip lines but they are inclined to swim upward when you retrieve line and your fly follows suit. A full sinking line, on the other hand, keeps the fly at the appropriate depth. Instead of carrying a spare spool for each line weight, try shooting heads which take up less space and are easier to change when you want to switch to another line. Dean Riphagen, author of the authoritative Stillwater Trout in South Africa has taken more trophy trout from dams than most fly fishers dream of. He prefers not to fish during summer when trout are sulking deep down. So, for all his fishing in the cooler months, he uses only a floating or intermediate line with a 4-metre leader, and a 2-metre leader on intermediate or sinking lines. As a general rule you will use a long, tapered leader for floating and intermediate lines and a short one, tapered or level, for sinking lines. Leader formulation and construction are subject to too many variables to cover here - details are available in the bibliography. Dragonfly and damselfly nymphs inhabit all trout dams locally and are available to the fish for the entire year. It is not surprising, therefore, that their imitations are the most widely used, especially if one includes the ubiquitous Woolly Bugger which is probably often mistaken by trout for a dragonfly or damselfly nymph. There are many excellent patterns available and hook sizes 8 to 12 should cover most eventualities: having a Woolly Bugger in the right place at the right time is probably as effective as any. Chironomids (midges) probably make up the bulk of invertebrate mass in our dams. Trout feed avidly on all three stages of the insect and so it is advisable to carry imitations of each. To imitate the larva try one of the generic bloodworm patterns (#10 to 16) or a San Juan Worm in #8 to 12. The pupal stage is the one that most anglers imitate and fish, and there must be hundreds of patterns extant. The well-known buzzer design is a proven fish catcher so choose one that inspires confidence. Hook sizes 12 to 18 cover the normal range but, on some Mpumalanga and KwaZulu-Natal waters, a #8 would not be inappropriate. The Griffith's Gnat has been the time-honoured adult imitation but in the last decade or two many new emergent and adult imitations have come to the fore of which the Shipman's Buzzer (#12 to14), the Palomino Midge Pupa (#16 to 20) and the CDC Once And Away (#14 to 20) have performed admirably. The larger mayfly species are not plentiful in local dams and hatches are generally rather sparse and sporadic. Most generic mayfly nymph patterns will take trout and there are several all-purpose, impressionistic patterns that are highly effective such as the Pheasant-tail Nymph (PTN), Gold-ribbed Hare's Ear, Zak Nymph, Red Fox-Squirrel Nymph, and the many Flashback variations of these patterns in #10 to 18. The minute 'angler's curse', one of several species in the Caenidae family, is the most abundant mayfly in South African dams. After hatching, they typically gather in dense, smoke-like, columnar swarms and the subsequent spinner fall usually drives trout into a frenzied feeding spree. This is the time for a long leader, a wispy tippet, #18 to 22 spinner imitations and stealthy casts. The Cased Caddis is Dean Riphagen's favourite larval pattern but not many South African anglers seem to be aware of the potential of casemaker caddis as a trout food item. The better-known pupal stage is well imitated by conventionally tied caddis-pupa patterns or the La Fontaine emergent-style pupae, all in #10 to 14. For an adult imitation look no further than the Elk-hair Caddis or the CDC-bodied equivalents. In the streamer category, Leech- and Bugger-style flies in #2 to 12, are increasingly starting to supplant the reliable Zonker. For those periods when trout start targeting minnows, there is such a dazzling array of imitations made largely of synthetics that you can pick one to literally 'match the hatch' in your local water. If you fish in dams where trout go through an abortive spawning ritual in winter, the Glo Bug or any of the many newer and more innovative egg imitations will usually prove successful. By the nature of things, beetles, grasshoppers, termites, moths and the like, fall on the surface of all bodies of water but, on some dams, wind-dispersed terrestrials can reach significant proportions and form an important component of trout diet. There is an extensive range of patterns to choose from, some imitative, others almost surrealistic. Most of the newer ones use foam to a greater or lesser extent for better flotation and realism. If I had to pick one of the more innovative patterns, it would be the Good Doctor's Beetle, developed by Dr Hans van Zyl on the Sterkfontein Dam near Harrismith. Don't forget a few tiny winged-ant imitations, particularly in autumn. In spring, the shallows are the first parts of a dam to warm up and they suddenly become alive with the myriads of creatures that have been quiescent during winter. Trout react quickly to this bonanza and from now until winter you can pursue them in the shallows at one time or another, albeit for only the briefest periods during the hot summer months. Nigel Dennis observes that in spring they will generally be in water less than 1 metre deep in the morning and afternoon and move to water between 2 and 4 metres deep during the middle of the day. On cool, overcast days they may feed throughout the day in the shallows. Dam fishing can become rather demanding in summer. Productivity in the shallows reaches a peak but, unfortunately, daytime temperatures start rising to levels that trout cannot tolerate, they become picky and have to seek the comfort of the cooler depths. They re-enter the shallows under cover of darkness to feed until dawn when the water temperature reaches its minimum for the day. The 40 minutes or so around first light is probably the best time to be on the water in high summer and to search the shallows with a GRHE or similar all-purpose impressionistic pattern. As the sun rises in the sky, the trout head for deeper water and so should you. As water temperatures drop during autumn, there is a resurgence of activity that draws trout back into the shallows where they feed heavily to pack on weight for the coming winter. Although many bugs will start to hibernate and aquatic plants will be in the process of dying back, there is still a considerable amount of food around. In some dams, at this time of year, large schools of minnows mass in the shallows where they come under repeated attack from marauding trout. South African dams do not become so cold during winter that insect activity shuts down completely; certain species of mayfly and chironomid still hatch during this period although less prolifically than in the warmer months. On many a mild sunny winter's day temperatures may rise sufficiently to stimulate insect activity and to entice the fish into feeding. In those dams without a suitable feeder stream, trout may be attempting to spawn around the inlet or on the coarser gravel along the banks. This rather small trout-fishing enclave lies at the western end of the well-known Magoebaskloof tourist region and has two fine trout streams, the Broederstroom and the Helpmekaar. The local club, the Haenertsberg Trout Association (www.htatrout.co.za), controls a stretch of the Helpmekaar, but it is open only to members. However, the public can access the club's dams or those at several private establishments in the area. Five headwater tributaries of the Olifants River have traditionally been earmarked for trout - they are the Klip, Waterval, Spekboom, Dorps and Sterkspruit - all centred on the town of Lydenburg. A sixth, the Sabie River, above the town of the same name, are managed by a local club, the Sabie Trout Club (www.bigskyoutdoor.co.za). The major trout rivers farther south are the Crocodile, its tributaries the Lunsklip and the Elands, and the two main branches of the Elands, the Leeuwspruit and Tautesloop. The Dullstroom Flyfishers Association (www.dullstroom.co.za/dff/) controls a dam close to the village and day tickets may be purchased from the Village Angler. Outside Machadodorp the Machado Flyfishing Club-Glenshee (glensheesa.webs.com.) has a number of dams. Most of the rivers are syndicated but some sections are open to the public. There are many venues in the region that provide excellent dam fishing for trout, some on a day ticket basis. The Johannesburg-Pretoria area does not have suitable trout habitat but there are several establishments, geared towards the upmarket side, that provide fishing for trout and other species. The fishing is confined to dams, principally during the winter months and is necessarily of a put-and-take nature. 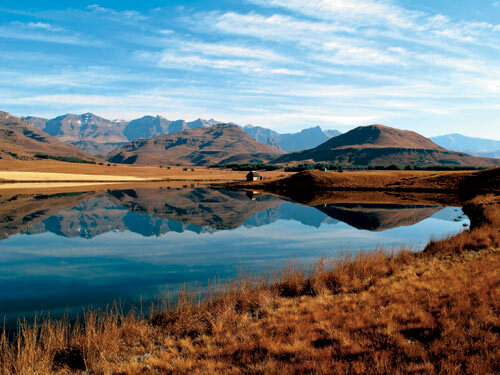 This region straddles the entire Drakensberg Range in and around Lesotho including the Maloti Mountains in the north. It is a well-watered catchment and the source of 90 percent or more of South Africa's trout streams and rivers - too many to list except for the larger ones. Starting in the northern KwaZulu-Natal Drakensberg and heading south the first major catchment is that of the Thukela River in which the Injisuthi and the three brown-trout rivers - the Bushmans, Little Mooi and Mooi - are the best known. The adjoining catchment is that of the Mkhomazi and its main tributaries, the Lotheni and the Mkhomazana, all of which hold brown trout. Next is the Mzimkhulu, the largest trout river in the country, and its two major branches, the Mzimkhulwana and the Ngwangwane. The Underberg-Himeville Trout Fishing Club (uhtfc.co.za) has access to a number of fine rivers and dams in the area while further north in the Midlands the Natal Fly Fishers Club (www.nffc.co.za), although it does not sell day tickets, is easy to join and controls a large number of river stretches as well as dams. The rivers mentioned above all originate in the Ukhahlamba Drakensberg Park (UDP), a World Heritage Site, administered by Ezemvelo KwaZulu-Natal Wildlife (EKZNW). Except for the Little Mooi, Mzimkhulu and Ngwangwane, all have fishable sections within the UDP. Permits to fish these streams and the Highmoor Dams are obtainable from EKZNW (Website: www.kznwildlife.com). Although most of the KwaZulu-Natal venues below feature dam fishing, several also provide river fishing. Continuing into Eastern Cape, it is the headwaters of the Tstitsa and its tributaries - the Pot, Mooi and Wildebees - that provide most of the fishing in the Mzimvubu River catchment. The Maclear Fly-Fishing Club (www.maclear.co.za/Trout.htm) controls many kilometres of these streams and a number of dams. The sources of the Bell, Sterk, Langkloof, Diep and Karringmelk tributaries of the Kraai River lie immediately to the west but on the opposite side of the Great Escarpment and so their waters spill into the Orange River. Although stream fishing for trout dominates in this region because of its high quality, there are also a few excellent dams. The Wild Trout Association (www.wildtrout.co.za) based in the village of Rhodes has access to numerous streams in the Kraai catchment. In Lesotho, the Maletsunyane, Senqunyane, Malibamatso and the Tsoelikane are the most important trout rivers that feed the Orange or Senqu, as it is known locally. Fishing is generally good and in some of the more remote rivers it is exceptional, but access is difficult. The giant Khatse Dam is the only stillwater and it is best fished from a boat or flotation craft. Much farther to the north, the Little Caledon rising in the high country beyond the Malotis is the only trout stream, but there are several dams that hold trout. The Townlands Dam in Clarens is stocked by the Clarens Fly Fishers Club and daytickets may be obtained from Outdoor Extreme. Except for the Naude's River at Somerset East, the only rivers capable of sustaining trout in this region are the headwaters of the Klipplaat, Cata, Wolf, Tyumie, Keiskamma, Buffalo and Kubusi, all of which rise in the Amathole Mountains. Currently none of these are considered to have trophy potential. The well-known Gubu and Maden Dams are productive fisheries that are controlled by the Amatola Fly Fishing Club (www.amatolaflyfishingclub.co.za) and are accessible to the public. The best dam fishing, however, is in the Stormberg, Winterberg and Somerset East districts where a number of venues offer remarkable opportunities for a true trophy trout. Visit the websites also of the Queenstown Flyfishers Club or the Bankberg Trout Fishers Club at http://www.qffc.co.za or www.anglerandantelope.co.za respectively for more information. The Western Cape is a region of unique beauty and biodiversity; it also features several trout rivers that are unique in many ways. So, if you plan to fish the Elandspad, Smalblaar, Holsloot, Witte and/or Jan Dutoits, then wend your way to the Cape Piscatorial Society (CPS) (www.piscator.co.za) offices where you can apply for a day ticket and obtain the latest information on the state of the rivers, licences, permits and so on. CapeNature has authorised the CPS to administer these streams, and beats are allocated on a first-come, first-served basis. For various reasons, access to the Jan Dutoits has been severely restricted, but if you're fit, the quality of the fishing may be worth the hassle. The Witte and the Witels are brown trout streams within a 2-hour drive of Cape Town. To fish the Witels from Happy Valley upwards, you must obtain a permit issued by the University of Cape Town Mountain and Ski Club. The reach below Happy Valley is state property for which CapeNature issues permits. Farther afield, the Kwaai River near Plettenberg Bay, and the Dorps River near Prince Albert also harbour brown trout. The CPS also stocks Lakenvlei (for members only). For anglers who wish to extend their understanding of how to read water and improve their fly-fishing skills through further reading on the subject. All these publications are currently in print. Brigg, P. 2008. The Call of the Stream. Art Publishers, Durban. One of the most beautiful fly-fishing books in print with a wealth of historical information and advice on fishing mountain streams. Miller, R.A. 2007. Stream Dynamics for the Complete Fly Fisherman. Whitefish Press. Meintjes, Malcolm and Pedder, Murray, Editors 2005-2009. Favoured Flies and Select Techniques of the Experts. Flyfishing Publications, Johannesburg. Each edition of this FOSAF-sponsored five-volume series deals with a variety of fish species for which different authors describe how to tie and fish their favourite flies. Randall, J. 2012. Moving Water - A Fly Fisher's Guide to Currents. Stackpole Books. Covers among others how currents affect fly fishing, which casts and techniques to use to compensate for variations in current speed at different depths and the effects of turbulence on water temperature and oxygen content. (From the website) Riphagen, Dean. 2004. Stillwater Trout in South Africa. Struik Publishers, Cape Town. The authoritative publication on fly fishing in dams in South Africa. Rosenbauer, T. 1999. The Orvis Guide to Reading Trout Streams. Lyons Press. Sutcliffe, T. 2009. Shadows on the Stream Bed. Platanna Press. www.tomsutcliffe.co.za. A celebration of fly fishing by South Africa's most celebrated fly fisher. Sutcliffe, T. 2011. Hunting Trout. Freestone Press, Cape Town. www.tomsutcliffe.co.za. Hunting Trout is the ideal combination of enjoyable reading and solid advice on how to fish for trout under local conditions. Cutcliffe H.C., 1863. The Art of Trout Fishing on Rapid Streams. Samson Low, Marston, Searle and Rivington, London. Dennis, N. 2004. Getaway Guide to Fly-fishing in South Africa. Sunbird Publishers, Cape Town. Leopold, L. 2003. A View of the River. Harvard University Press.